MINI India today announced its participation in India Design ID 2019, the country’s most definitive luxury design week that features the best of Indian and Global Design. ‘MINI LIVING - BUILT BY ALL’ installation will be showcased from 12th to 15th February 2019 at India Design ID 2019 in New Delhi. MINI LIVING - BUILT BY ALL is an installation that reveals a visionary living concept brought to life in close collaboration between residents and architects. A surface area of just few square meters is used to create very personal and attractive spaces, reflecting MINI’s core principle of the ‘creative use of space’. It provides creative solutions for collaborative urban living offering many possibilities and a high degree of flexibility. 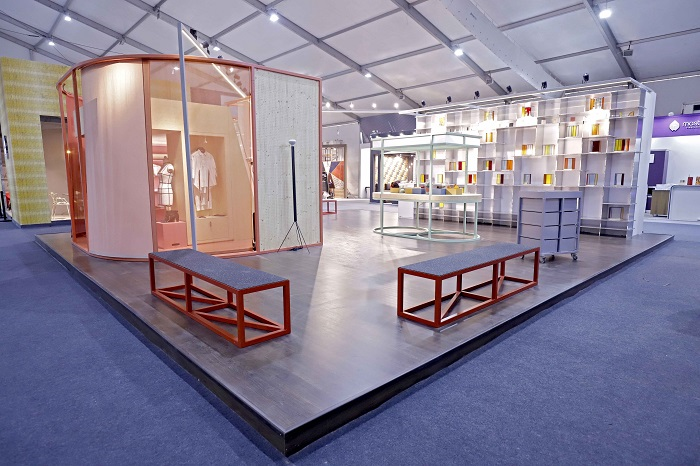 MINI LIVING - BUILT BY ALL at India Design ID 2019 will comprise of an Installation themed around a ‘fashion pattern cutter’ persona as well as ‘Factory of Ideas’ which will engage visitors in creating a vision of their own personal urban living space. The MINI brand is committed to applying its reputation for design innovation beyond the production of iconic cars. MINI LIVING is MINI’s vision of an urban life that is built on minimum footprint, where collaboration and creative use of space come together to find real solutions for how we live, work and interact in our cities. Visitors to India Design ID 2019 can explore the benefits of MINI LIVING for residents in the future. Moving beyond the installation, they can become creators in the FACTORY OF IDEAS. In keeping with the idea of participative architecture, visitors are encouraged to build their own miniature MINI LIVING unit according to their personal preferences, using abstract building blocks made from a variety of high quality materials. These will be displayed on the wall of fame over the course of the installation. MINI LIVING is an initiative first launched by MINI globally in 2016 with the aim of devising creative architectural solutions for the urban lifestyles of the future. MINI LIVING has already exhibited visionary concepts for shared and collaborative living/ working in United Kingdom, China and Italy. The first habitable MINI LIVING project will also open its doors in Shanghai in 2019. Here, an innovative space-related concept for living and working is taking shape in a converted industrial buildings on a surface area of just under 8,000 square meters. Issigonis creation was remarkable, but it really only became a MINI when he got a little help from his friend, motorsport pioneer John Cooper. Cooper took the prototype out for a spin and realised this fuel-saving people’s car cornered like no other. He convinced Issigonis to ready the MINI for the Rallye Monte Carlo. The rest is racing history. If Issigonis was a Minimiser, Cooper was something of a Maximiser: While the former focused on essential, the latter was all about maximising the experience. Of course, the first MINI did not re-invent the wheel. It fundamentally revolutionised the idea of what an automobile could be. It broke rules. Its innovative suspension system gave it the famous MINI go-kart feeling that fans still rave about. Its exterior, created by an engineer who dared to think differently, was unmistakable – and made the MINI an instant design icon. But perhaps most of all it was the productive tension between the approaches of Issigonis and Cooper, the dichotomy between the minimalist and the maximalist, which made MINI so unique. This resulted in a bold, small car that saved fuel, but not on driving fun. And that continues to inspire to this day.